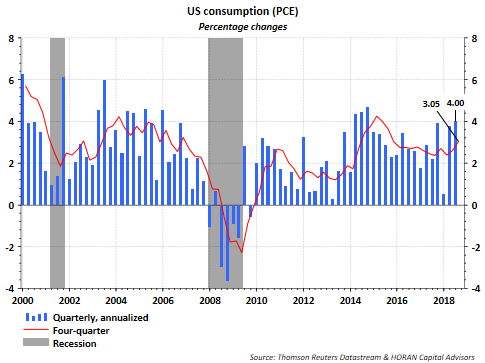 U.S. consumer consumption continues to trend higher, running at a 4% annualized pace based on quarterly consumption reported in last Friday's advanced estimate of GDP. This is up from 3.05% in the second quarter. The consumer accounts for nearly 70% of economic growth and in and of itself, this is a positive input. 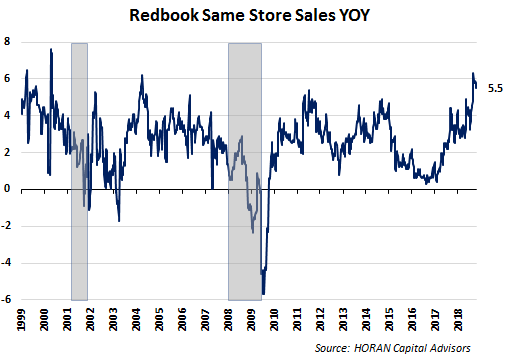 Redbook reports weekly changes in same store sales and last week the report shows same store sales up 5.5% on a year over year basis. This now represents two consecutive weeks of a slowing pace in the same store sales results. However, Redbook notes the 5.5% growth rate remains one of the strongest in more than ten years. Recent strength in the performance of retail stocks provides some confirmation of this strong retail environment. 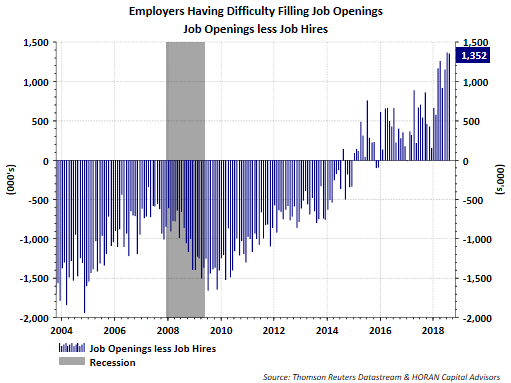 Strength in the consumer is supported by a strong job market with job openings continuing to outpace job hires. Not shown is the fact job openings are up 18% on a year over year basis and exceed the number of individuals actually looking for jobs by nearly 1.2 million. 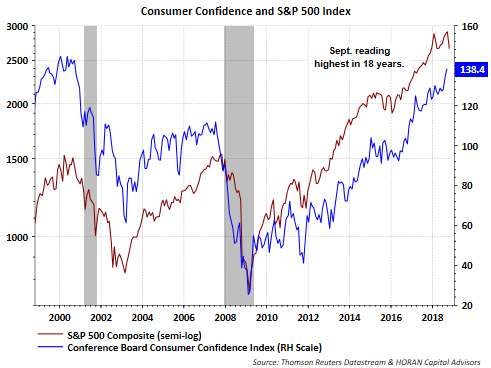 "After a considerable improvement in August, Consumer Confidence increased further in September and hovers at an 18-year high," said Lynn Franco, Director of Economic Indicators at The Conference Board. "The September reading is not far from the all-time high of 144.7 reached in 2000. Consumers' assessment of current conditions remains extremely favorable, bolstered by a strong economy and robust job growth. The Expectations Index surged in September, suggesting solid economic growth exceeding 3.0 percent for the remainder of the year. These historically high confidence levels should continue to support healthy consumer spending, and should be welcome news for retailers as they begin gearing up for the holiday season." ISM Manufacturing Index: "Modest easing in new orders headlines what is another exceptionally strong ISM manufacturing report where the headline index, at 59.8 for September, came in right at expectations." And as it relates to capacity utilization, "The build in backlog orders eased 2 points but remains elevated at 55.7 with other indications of capacity stress also easing but only slightly as both delivery delays and cost increases, at 66.9, remain heavy. The stress, however, isn't slowing production which rose 6 tenths to 63.9 for the strongest showing since January this year." 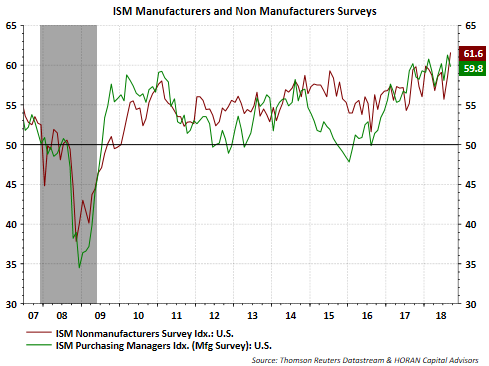 ISM Nonmanufacturing Survey: "Led by a record high in employment and a 14-year high in business activity, the Institute for Supply Management's non-manufacturing composite index easily beat Econoday's consensus range coming in at 61.6 for September. This is the strongest result yet for the composite which was established in 2008. According to the report 15 of the 18 manufacturing industries reported growth in September. The survey itself was established in 1997." The Econoday report summarized the positives in the report by stating "the list goes on." Manufacturing and Non-manufacturing activity is certainly robust. Recent weakness in the U.S. markets was preceded by weakness in the foreign markets. 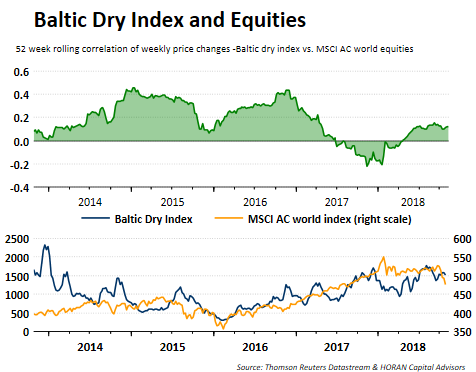 However, reviewing some of the 'activity' variables, like the Baltic Dry Index (BDI), global economic activity continues to be supportive of an expansionary environment. The Baltic Dry Index is reported daily by the Baltic Exchange in London. The index is a benchmark for the price of shipping dry commodities by sea. The Exchange obtains the price for shipping product on three different ocean going ship sizes. Because the commodities being shipped tend to be inputs into the manufacturing products, the BDI can serve as a leading economic indicator. As the below chart shows, the blue BDI line continues in an uptrend although the All Country World Equity Index has turned lower. If one believes the BDI is a leading indicator, then its continued trend higher would be supportive of better global economic activity looking ahead. If there is one factor that deserves attention related to international economies, it might be the trade dispute between China and the U.S. Developed European markets benefit from growth in the emerging market countries. 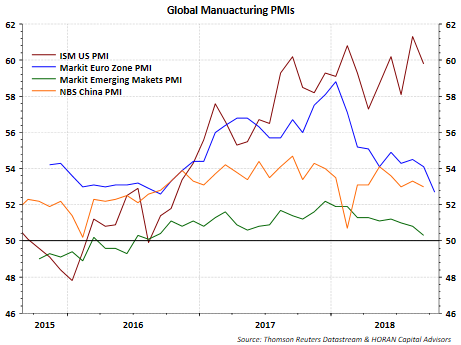 However, the biggest emerging market country, China, may create a headwind for the European continent as China economic activity slows due to the trade dispute with the U.S. And as China economic activity slows, the PMI's in certain regions around the world have turned lower. However, their readings remaining expansionary. "The economy continued to power forward in the third quarter on the back of household spending [lagging] investment activity, however, raises some red flags. Overall though nothing to dissuade the Fed from hiking rates. Watch how price pressure evolve in the coming months. If they break higher, a slowing economy will not deter the Fed from hiking rates, at least until it slows enough that Powell & Co. believe the pressure is off – this may require higher unemployment rates. That’s where you need to start more aggressively pricing in the end of the cycle." Tim's report summarizes our point of view pretty closely. As it relates to his unemployment comment, it is one reason our firm monitors the following chart and have written about this in the past. 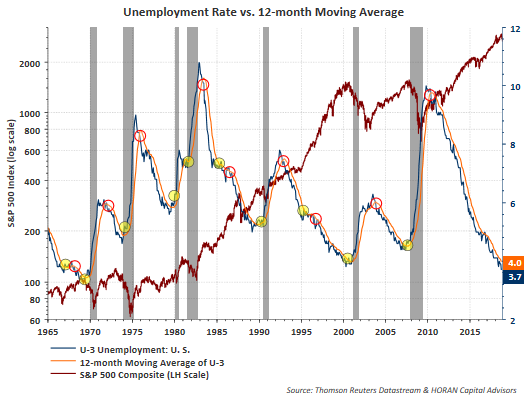 Economic turning points seem to occur when the reported unemployment rate crosses, from below, the 12-month moving average of that same rate. It is not the only variable to track, but one that is receiving attention at this point in the economic cycle.